Recently, I finished reading Clay Shirky’s excellent new book, Cognitive Surplus. One of the points he made which really struck home with me was his discussion of how “more” has a quality all of its own. To drive home the point, Shirky discussed how “pizza by the slice” works as a business model in big cities like New York City whereas it isn’t a feasible model for a small town pizzeria. In a small town, the reality is that there just aren’t enough people craving a slice of vegetarian pizza for a pizzeria to make a whole pizza in advance of an actual order. In a large city like New York City, however, although the pizzeria won’t know who will order such a veggie pizza slice they can have some confidence that, due to the law of large numbers, a few people will likely want enough slices of veggie pizza at, say, 8pm on a Thursday evening to make it worth their while to bake a whole pizza. I begin with this analogy because I believe, as a futurist, that society is about to begin seeing an explosion of new business models in the automotive industry which will exploit this same principle. For example, take a look at the photo above. 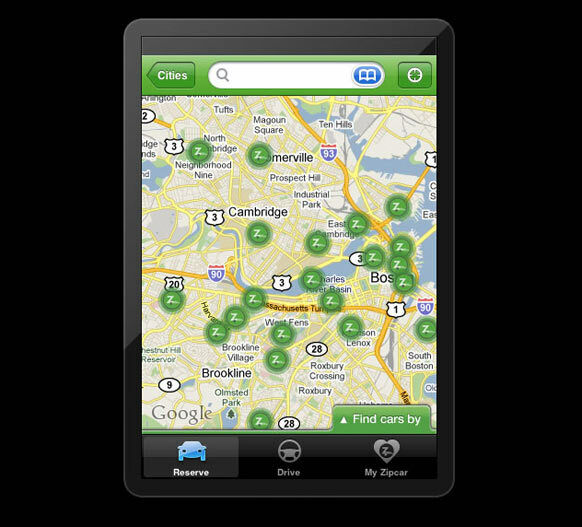 It is an App for Zipcar and it shows where cars are available in the Boston. Such people still crave the utility of an automobile—just as many people will still crave a slice of veggie pizza—but they can’t afford it. The solution? Cars-by-the-slice. In short, due to the law of large numbers—as well as advances in GPS and social networking technology—smart companies have begun making cars available when and where people demand them. If you don’t believe this trend is real, read this recent article in The Economist explaining how Daimler is ”thinking outside the car” on new business models.